Welcome to fourth part of 'JDBC in Java tutorial Series'. In previous discussions we came across, 'How to create a connection in JDBC ', 'Create table in Java JDBC ' and 'Insert data in a table in JDBC'. In this particular blog we will come across 'How to delete a row from a table in JDBC'. We will create a connection to db and that obtain a statement to execute query on it. This is the overall project structure for today's discussion, we have added a 'my-sql-connector,jar' in lib folder to make the connection happen. Please make sure that the jar file is being added to the project's classpath. 'CreateConnection.java' class contains the code to create a connection with database and 'CreateTable.java' class contains the actual code to create a table in database using JDBC. 'InserData.java' is used to run a jdbc insert query. 'JdbcDelete.java' is the main implementation class where actual delete query in executed. This is the sample database that we have used to get a connection and create a table, execute the code below in your MySql query editor. Deleting a row from a table in jdbc is a very simple process we just need to obtain a jdbc connection and suitable statement. Then a simple sql create query is executed in that statement. Insert values in a table in jdbc is a very simple process we just need to obtain a jdbc connection and suitable statement. Then a simple sql create query is executed in that statement. 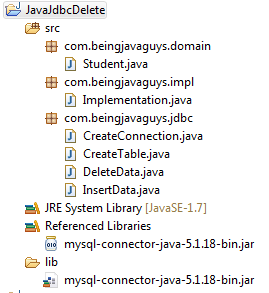 String query = "insert into user values(" + student.getId() + ",'"
Create a table in jdbc is a very simple process we just need to obtain a jdbc connection and suitable statement. Then a simple sql create query is executed in that statement. String query = "create table user (" + "id int,"
+ "first_name varchar(30)," + "last_name varchar(30),"
This class contains the code to create a connection to database, detailed explanation can be found from here. This is a simple java class, we have called the required code here to see the actual implementation. In this particular blog we came across how to delete a row from a table in java JDBC. In upcoming blogs we will see more about JDBC including JDBC Create Connection & JDBC Create Table & JDBC Inset Query and JDBC Update Implementation in Java.